A native of Clearwater, Florida, Paige started sailing when she was eight years old, really stepped up her game when she was fifteen, and won her first ISAF Youth Worlds in Madiera, Portugal when she was just 16. “It was a monumental moment in my career,” she said. 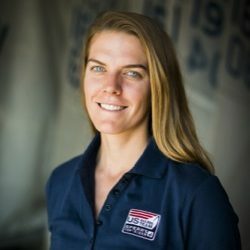 Paige has been sailing the Laser Radial since she was fifteen years old and hopes to achieve a Gold Medal at the 2016 Olympic Games.